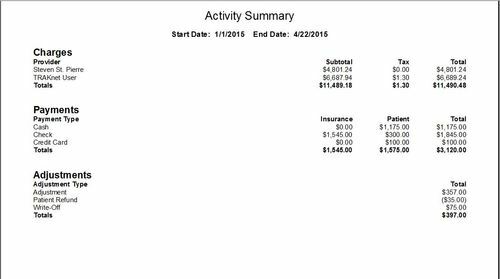 The Activity report is a standard billing report found under the Billing Dashboard, in Reports. It is used to get an overview of the charges entered, payments taken and adjustments made. You can run this report for a single day, week, month, year or for any range. It has a summary view and a detailed view. Summary – this will give you the totals. Charges are broken down by provider. It will pull from the provider set on the Encounter for where the charge is located. Payments will be broken down by payment type, and will be further broken down by amounts that are insurance payments and patient payments. Adjustments will list the totals of provider payments broken down by payment type. When locations are entered in the location filter, the summary view will also provide you with location-specific information, including total charges, payments, adjustments, Net A/R and Total A/R per location and provider. When the "Group By" filter is set to Provider, each provider will be listed with a summary of each location's activity related to that provider. When the "Group By" filter is set to Location, each location will be listed with a summary of each provider's activity at that location. Detailed – this section will include the summary sections and will also list each individual item. For charges, each charge, as well as its service date, note date, responsibility date (if applicable), the patient related to that charge, the code, subtotal, tax and the total billed for that charge will be listed. Payments will list each individual payment, the date of payment, the payer, any comments for that payment, and the payment amount. This same information is included for adjustments. Date Range – specify the starting date and ending date for the report. With the date range set, the charges will be filtered according to date of service. The payments and adjustments are filtered according to payment date. Locations – choose only charges that were rendered or payments and adjustments related to charges that were rendered at that location. This is based on the location set for the Encounter on which the charge is located. When choosing the location, both the short name and long name will display. Provider – choose only charges that were rendered or payments and adjustments related to charges that were rendered under that provider. This is based on the provider set for the Encounter on which the charge is located. Please note that when using the Location and Provider filters, unapplied payments will not show on this report as those filters reference the charge, not the payment. Payment Type – choose to display just charges, payments or adjustments. 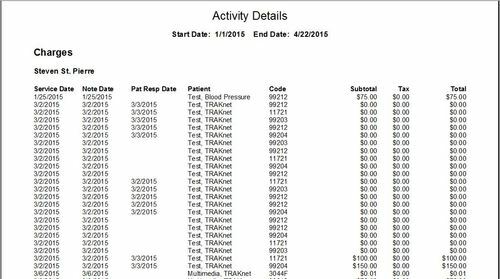 Patient Group – only charges, payments or adjustments related to patients under the specified groups will display. 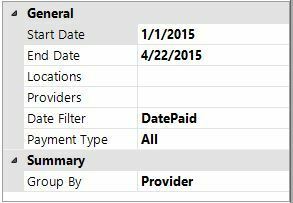 Date Filter – designates whether the date range should reference the specified service date/payment date or the date that charge/payment was entered into the system.